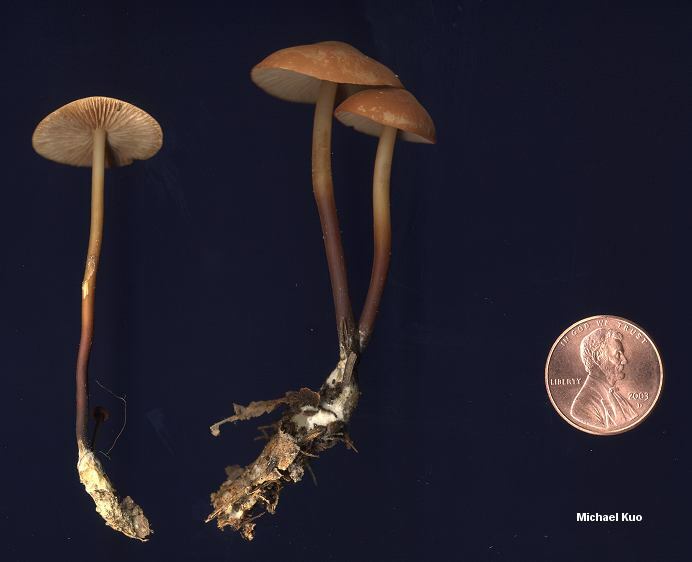 To the naked eye, Marasmius cohaerens is a bland, boring LBM (Little Brown Mushroom), partially distinguished by its white spore print and its darkening stem with white mycelium at its base. Under the microscope, however, the mushroom is completely transformed and becomes fascinating and unmistakable; it is covered with dramatic cystidia and "broom cells" (special cells with finger-like projections). In central Illinois Marasmius cohaerens is a late spring and early summer regular, though it also appears in late summer and fall. It is a diligent decomposer of leaf and twig litter in oak-hickory and beech-maple forests. Marasmius cohaerens var. lachnophyllus differs in having close or crowded gills; it is also more likely to be found on logs or twigs than Marasmius cohaerens proper, which usually decomposes leaf litter and humus. Other, more tentative differences in features can sometimes be used to separate these varieties; see Gilliam (1976). Ecology: Saprobic on leaf litter and woody debris in hardwood forests (primarily oak-hickory and beech-maple woods, but also in hemlock forests where beech is present); growing alone or, more typically, in clusters of two or three (hence the species name cohaerens); early summer through fall; widely distributed in eastern North America. Cap: 1-3.5 cm across, convex, becoming broadly convex; smooth or somewhat wrinkled; the margin sometimes lined; yellowish brown to reddish brown, sometimes fading dramatically along the margin. 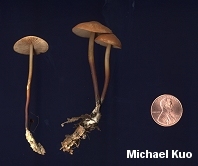 Gills: Attached to the stem; distant or nearly so (but see comments below); pale at first, becoming tan, or even light brown; sometimes developing brown edges. 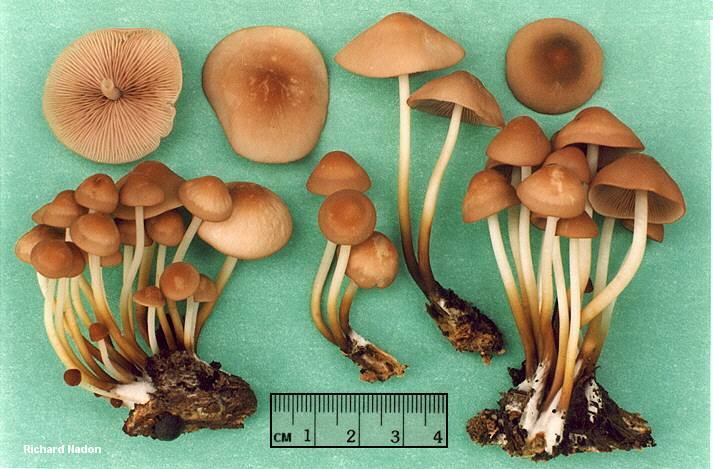 Stem: 3-8 cm long; up to 3 mm thick; equal; dry; straight or slightly curved; whitish to yellowish brown at first, but soon darkening from the base up to dark brown or dark reddish brown; usually with copious, whitish basal mycelium. Odor and Taste: Taste mild or with a slightly bitter or acidic aftertaste; odor mild or pungent and unpleasant. Chemical Reactions: KOH on cap surface pale olive. 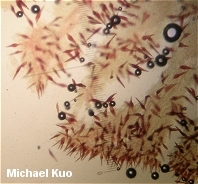 Microscopic Features: Spores 7-10 x 3-5.5 µ; smooth; elliptical; inamyloid. 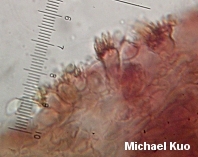 Cystidia ("setae," according to authors who do not limit the term to non-gilled mushrooms) prominent, variously shaped but often fusiform; 20-110 µ long; with thick (to 3 µ) walls; dextrinoid. Broom cells present on gills and cap surface. REFERENCES: (Albertini & Schweinitz) Cooke & Quélet, 1878. (Persoon, 1801; Fries, 1821; Saccardo, 1887; Kauffman, 1918; Gilliam, 1976; Smith, Smith & Weber, 1979; Phillips, 1991/2005; Lincoff, 1992; Barron, 1999; Halling & Mueller, 2005; McNeil, 2006.) Herb. Kuo 08270205, 05290401, 07040701, 06160801.